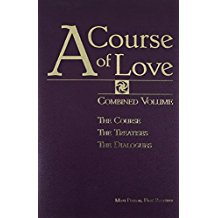 CoRelate ACIMOE-ACOL enables you to correlate words and phrases that appear in both A Course in Miracles (Original Edition) and A Course of Love. Exploring their relationship offers deeper and fuller understanding of the message of both ACIM and ACOL. CoRelate ACIMOE-ACOL is offered here with love and at no cost. The result lists all instances of the word or phrase in both ACIMOE and ACOL. Each instance includes the context in which the word or phrase appears and a reference in the left column is hyperlinked to the full paragraph in the corresponding book. From that full paragraph you can also view previous and next paragraphs within the same chapter. You may need to scroll within the ACIMOE and/or ACOL sections to see all of the results. Detailed instructions on how to refine your search are provided in the Search Guidelines, along with many insights and examples that help you to make the most of CoRelate ACIMOE-ACOL. A combined concordance and comparative word counts, as well as referencing guides for both Courses may be viewed at More Cool Stuff. Christina and Colin Strutt created two search facilities — CoRelate ACIMOE-ACOL and Discover ACOL — both born from their expertise and creative inspiration. We are deeply grateful for this amazing, awesome, wonderful, and totally cool contribution! We encourage readers to be aware that Christina Strutt, on whose website CoRelate is hosted, offers a powerful “CoCreating Clarity” practice based on the principles of truth and love as brought through both ACIM and ACOL.